I remember when I first heard about Bog People. 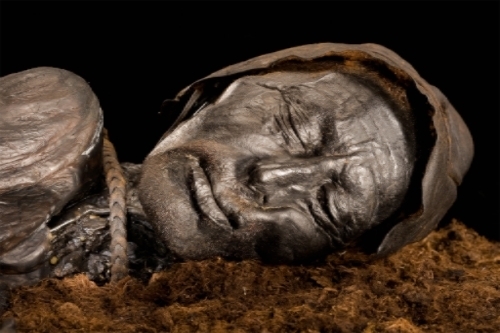 2000 year old corpses were being pulled from the earth, perfectly preserved like the one above. The historical data gathering possibilities had my head swimming with the revelations that would hopefully be ascertained. When a body is found in the peat on the Hebrides of Scotland, the first thought is, here is another time capsule from the past. From the past indeed, but not two thousand years, not even a thousand years or a hundred years. The Elvis tattoo on the man’s forearm precisely dates that the corpse became a ghost fifty some years ago. If this were an episode of the Twilight Zone or an Outlander traveling through standing stones or a Jules Verne Time Machine situation, maybe we would need to call in Mulder and Scully to investigate, but this is a straightforward, hide the body in the peat and hope no one finds it scenario. Meanwhile, Fin Macleod has quit his job in Edinburgh and decides to move back to the island to repair his parent’s derelict croft and, at the same time, make amends for the way he treated his ex-girlfriend, Marsaili. He doesn’t, frankly, deserve her, but maybe he does, at this point, deserve some forgiveness. What we do as young men and women should have an expiration date as we prove ourselves to be better human beings. The weight of our past transgressions can never go away, but it can be made lighter. In the first book, I had a hard time forgiving Fin. Marsaili’s love for him was so pure, so unconditional. For her, he was her soulmate from the very moment she laid eyes on him as a wee lass. He broke her heart, and in the process, he broke my heart, too. What a tribute to the writing of Peter May that he managed to put me in the book and experience Marsaili’s pain as my own. When they test the DNA of the peat bog corpse, they discover that he has to be a close relation to Marsaili’s father. And it is truly a What the Hell moment. Her father is suffering from alzheimer's and dementia. He remembers the past better than the present, but even those memories are becoming fragmented. It is difficult for him to tell a coherent story as his mind drifts from decade to decade like a spinning wheel that occasionally stops only to start again. He isn’t who he says he is. Marsaili, already struggling with a series of drastic situations going wrong, now has to face the fact that she isn’t who she thought she was. With only her Dad’s uncertain memories, she and Fin have to go to Edinburgh and start the journey to discover who her father really is and what happened to the man in the bog. Revelations take them to other islands in the Hebrides with the hope they discover enough information to prove that he father was not the killer of the bog man. At one point, Fin comments that the only time you notice the wind is when it stops. I live in Dodge City, Kansas, which is routinely considered the windiest place in the United States, so when he made that comment I knew exactly what he was talking about. The weather is a constant threat on the Hebrides. You have to love it, or you start to hate it. Maybe a bit harsher than what I would have said, but certainly Fin and I would find agreement on this subject. Peter May ensnares the reader and soon has you walking down a road on Lewis Island, being blown sideways by the wind and hearing the ”tireless legions of riderless white horses crashing up against the stubborn stone of unyielding black cliffs.” The plot will wiggle into your brain and haunt your dreams until you give up and turn the light on to read a few more chapters. The smell of cut peat, the woodsmoke when it is finally dry enough to burn, and the howling wind that makes music with the eaves of your croft and whistles a tune through any hole found round your windows or doors will send shivers through you. You will be there wanting to leave, wanting to stay, but knowing you will return for book three.